The Lolliladies done it again!! I am totally feeling this photo booth! I swear, if I could turn back time, I would soooo do this for my wedding. :-) I can't believe this photo booth was a DIY project. 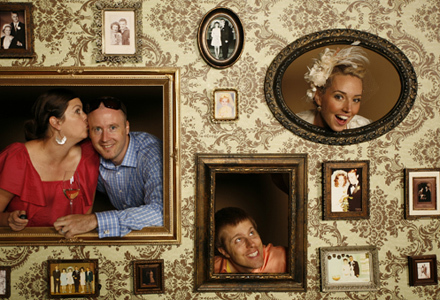 "They covered a large piece of wood with wallpaper and then added framed family photos." This is taking DIYing to a new level, get a load of this photo booth I found on Theknot! Loves it!! A simple way to impress your guests is to recreate any of these looks the DIY way! I found simple directions on the Celebrations site. Find 2 nesting bowls, or a large and small bowl with a similar shape, and fill the larger bowl halfway with water. Place the smaller bowl inside the larger bowl and weight it down a bit with a clean rock; you want the bowl to float and have about an inch of water on the bottom. 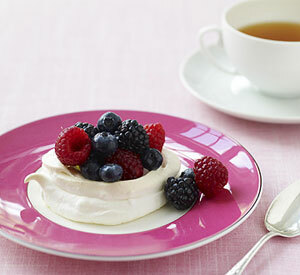 Add flowers or leavers in between the bowls, wedging them down into a nice arrangement. 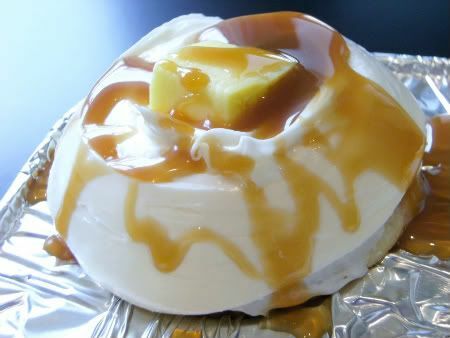 Use tape across the top of both bowls to keep the smaller one centered and freeze until solid. Unmold and place on a broiler pan that is completely covered with leaves. The pan will catch the water as it melts. Tip: check on the water level throughout the party and use a baster to remove water if necessary. 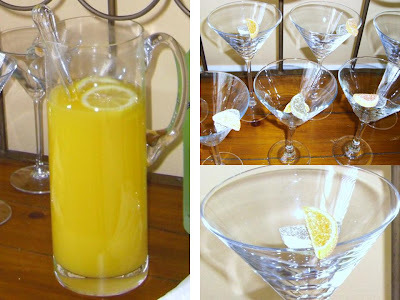 Check out Celebrations for more summertime party ideas and tips. 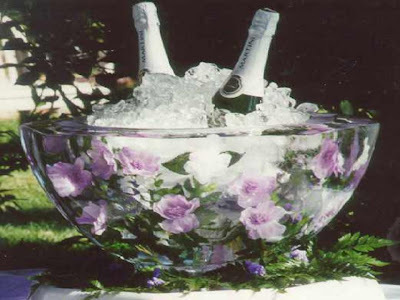 And take a look at one of my girlfriends' very own DIY champagne or wine ice bucket! Cool huh? It turned out great, I was impressed!! Cindy Palmer you are the winner! Here's the winning comment. "Hey Tasha..Nice Job! The Woven Lattice Runner would be great." Cindy please send me an email with your contact information so we can get your new chic runner to you! Today is the last day of our giveaway! You have one last chance to win. Choose between the modern Chilewich Woven Lattice Table Runner or a set of 4 contemporary stainless steel mesh Chilewich Napkin Rings. The winner will be randomly chosen, and announced tomorrow. 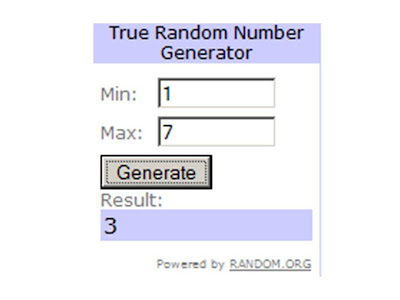 Try your luck, it's easy to enter. Simply leave a comment below telling us which gift would be of use to you. A happy couple off to a new start, wanted to put a fresh feel to their engagement party. What's more fitting than lemons and limes!? Signature Cocktail,Lemon Drops were served and garnished with sugary lemon & lime slices. Want a modern new look for your dinner table? Preparing an intimate lunch for a few friends? Well try winning one of these pieces to dress up your table. 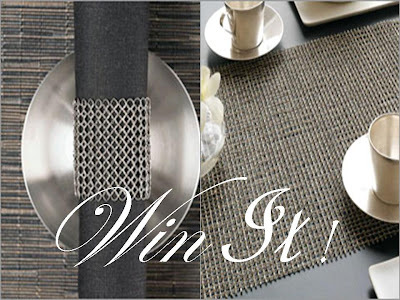 We are hosting a great giveaway sponsored by www.BeddingSets.com! They are an online bedding store that offer a wide variety of adult and children's bedding, home decor, and accessories. One lucky winner will receive a choice between a set of four Chilewich Napkin Rings or a Chilewich Woven Lattice Table Runner. This giveaway will run through Wed. 7/22/09, so don’t miss out on your opportunity for a chance to freshen up table with a chic new look! Chilewich Napkin Rings are made of a stainless steel mesh weave that creates the perfect accessory for a contemporary table setting. The ethereal appearance of Chilewich's innovative textile, the Woven Lattice Runner has been linked to crystal, jewels and even ice. This modern textile is durable and maintenance free. 1. Simply leave a comment below telling us which gift would be of use to you. 2. Blog about our giveaway, then leave a comment below with your blog post in the website box of the comment section. Below is a simple text which you can copy to put into your post. "Natasha over at Fete Fanatic is giving away a great set of napkins and rings sponsored by BeddingSets.com! Their online store features not only great bedding, but a variety of home accents. Head over to Fete Fanatic for more details on how to win!" You can do both of these to increase your odds! Please leave separate comments for each entry. Sugar,Spice & Everything Nice shower was included in the Baby shower idea bliss feature today over at Creative Parties & Showers! You'll find lots of inspiring real parties on Shannon's blog! OMG... "1 Upon a Time," Brilliant!! Did you see this Vintage Fairytale Fabulous party designed by Lollipop Events & Designs? I am totally digging this color palette of aqua blues and gold! What a lucky little baby to have such an amazing fete first Birthday party. Check out more eyecandy at the Lolliblog! You just have to see these amazing cupcakes!! Looks real, huh? I love these popcorn cupcakes by cakes by Jenn. 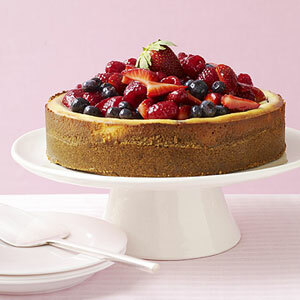 Check out Kids Birthday Parties for the recipe. If you are looking for an easy green centerpiece, try using Wine Bottles as Vases. It makes for a simply beautiful centerpiece with a lean silhouette that mimics a bud vase. Not a wine lover? Try a beer bottle! These bottles look almost identical huh.. Of course the beer bottle will be a bit shorter than the wine bottle. But talk about the look for less.. When it comes to the bridal party, we tend to fucus most on our bridesmaids. 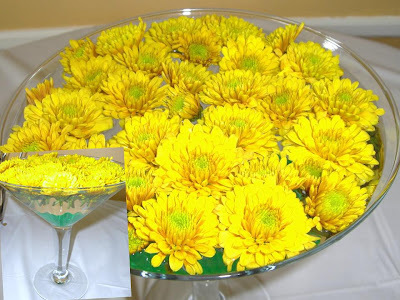 Why not make the little ones (flower girls) feel just as special? 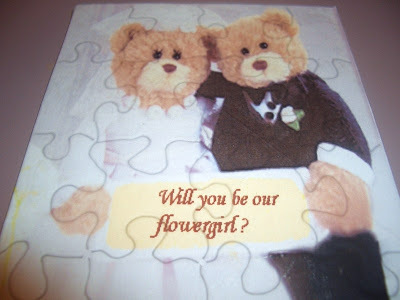 Send her a " Will you be our Flower Girl card! To make it fun, turn it into a little game for them. Along with a little rhyme, I gave her a puzzle for her to put togerther. I purchased blank puzzle pieces, used a sticky vellum like paper to transfer an image onto it. Then used an exacto knife to separate the pieces. Can you say TEDIOUS!?! I tried to make this card as interactive as possible for the little ones. Envelope that housed the puzzle pieces. 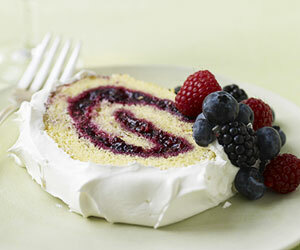 Serve one of these yummies up this weekend! This morning on Regis & Kelly,The Nest Editor-in-Chief Carley Roney shared great ideas for throwing a memorable, last-minute 4th of July bash on the cheap! 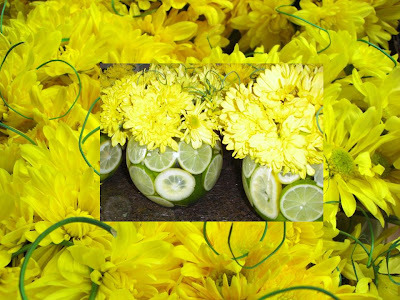 You can check out Regis & Kelly's site for more infomation on how to create these tablescapes. The goal for your celebration is for it to be fun and festive.. right? So start with the invitation! Though it's meant to be informative, you can still be cute by including a fun,festive little rhyme. Invitations are the first impression you give your guest, make it fun! It's rhyme time! You can incorporate the theme of the party into the rhyme as well. Remember the Sugar n Spice Baby Shower? I mentioned the theme in the rhyme, so the guest had an indication of what's to come.